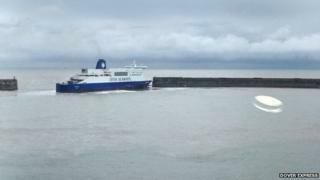 Four people were injured when a cross-channel ferry leaving Dover for France hit a harbour wall. The Dover Seaways struck the dock as it departed for Dunkirk at 08:00 GMT. Passengers and crew were evacuated from the DFDS vessel. Paramedics said four people were taken to hospital with "bumps and bruises". A spokeswoman for the ferry company said: "We would like to underline that passenger safety is of paramount importance to us." "We're working hard with all passengers and relevant authorities to provide assistance to those involved," she added. The ferry is currently being assessed for repairs and has been berthed at the Eastern Docks. One eyewitness told the Dover Express: "The ship's rudders went 30 degrees to starboard but by time they got to the entrance it was too late. "It must have hit at about eight knots (10mph)." South East Coast Ambulance Service said the injured were taken to the William Harvey Hospital in Ashford. "None of them are thought to have suffered life-threatening or serious injuries," a spokesperson said. Carsten Jensen, senior vice president of DFDS Seaways, said: "All 320 passengers and freight have now disembarked the vessel and those who chose to continue their journey have been accommodated on other ferries. "I would like to apologise to all passengers and freight customers who have been affected by this incident." The Port of Dover said an investigation would begin to find out what happened. Sea conditions in the English Channel were slight to moderate and visibility was good just before the ferry set off on its journey.